Which road will you take?For eighteen years, Jude Farraday has put her children’s needs above her own, and it shows—her twins, Mia and Zach—are bright and happy teenagers. When Lexi Baill moves into their small, close knit community, no one is more welcoming than Jude. Lexi, a former foster child with a dark past, quickly becomes Mia’s best friend. Then Zach falls in love with Lexi and the three become inseparable. Jude does everything to keep her kids on track for college and out of harm’s way. It has always been easy until senior year of high school. Suddenly she is at a loss. Nothing feels safe anymore; every time her kids leave the house, she worries about them. On a hot summer’s night her worst fears come true. One decision will change the course of their lives. In the blink of an eye, the Farraday family will be torn apart and Lexi will lose everything. In the years that follow, each must face the consequences of that single night and find a way to forget… or the courage to forgive. 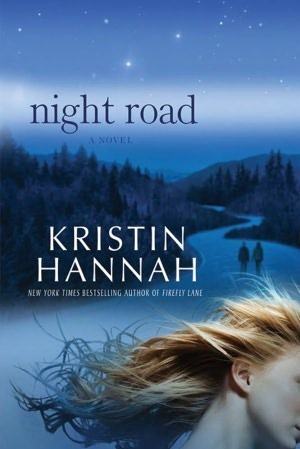 I love Kristin Hannah and I loved this novel. I had put my name on the waiting list at the library but ended up buying it as I just couldn’t wait. It did not disappoint. I couldn’t put it down but I didn’t want it to end. NIGHT ROAD is a gripping and emotional read, extremely painful at times, but so worth it. Kristin Hannah writes books that everyone can relate to in one way or another. My teenage daughter ended up reading this one as soon as I finished it, and she loved it too. An extremely well-written tale of love, friendship, loss, and forgiveness. I can’t wait to read it again! I’m glad you enjoyed it too! I just love her books. I really do want to read this one again at some point. I just picked up a second hand copy of this last week as I’d heard so many good things about it. I have had this on my tablet for s long time. Thanks for the reminder. I really need to read this one as I love anything I have read by her. I hope you get to it soon. Happy reading!